When an El Salvador woman and her two children arrived from a Buffalo shelter to the Fort Erie border crossing Wednesday, seeking to make a refugee claim in Canada, a team of lawyers from Toronto’s Downtown Legal Services was on high alert. They had U of T law students waiting and watching and reporting back from the border. When an El Salvador woman and her two children arrived from a Buffalo, N.Y., shelter to the Fort Erie border crossing Wednesday, seeking to make a refugee claim in Canada, a team of lawyers from Toronto's Downtown Legal Services was on high alert. They had U of T law students waiting and watching to report back from the border. As soon as the woman — identified only as "ABC" in court documents — was denied entry under the Safe Third Country Agreement, the legal team filed a Federal Court challenge to the agreement, which they had been working on for months. The agreement requires refugees to request protection in the first safe country they arrive in. 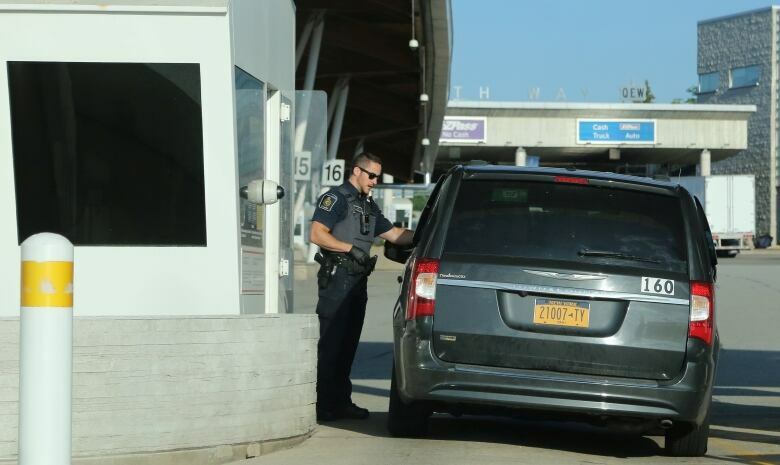 Refugees crossing from the U.S. at official border crossings are usually denied entry into Canada. That's part of the reason why so many risk sometimes dangerous illegal border crossings to make a refugee claim once already in the country — a legal loophole that's permitted. This is the second legal challenge to the agreement but the first with a person at its core. "I feel happy and nervous and I am very thankful the lawyers are helping," said ABC through a translator, when CBC News met her in a Toronto home on Thursday. "Canada is more humane than the U.S. In the U.S. it's not safe, and I was worried about being sent back to El Salvador." Justice Ann Marie McDonald granted the woman a stay to live in Canada while her case is being considered. McDonald said there was clear and non-speculative evidence that she would suffer irreparable harm if she were to return to the U.S. and could even be sent back to El Salvador. ABC's lawyer, Prasanna Balasundaram, said that some of the strongest legal arguments in this case are based on charter rights. She is facing removal procedures in the U.S., and gender-based asylum claims in the U.S. have inconsistent results. He said that ABC has lasting psychological effects from persecution in El Salvador. "Her family is the subject of gang violence in El Salvador," said Balasundaram. "I dream that all my family is together after all these years and that we don't have to go home because of the gangs," said ABC. The woman left El Salvador on Nov. 10, 2016, with her two daughters, who are minors. She paid agents to help her cross overland through Guatemala, Mexico and the U.S. The travel through Mexico was the most harrowing because of the fear of narco-traffickers, she said. When she finally made it to Canada, she joined her common-law husband, who has been living here for years, working with Toronto Downtown Legal Services on his own status. "When certain NGOs learned of our case they joined us ... that gave us lots of support," said Balasundaram. Amnesty International, the Canadian Council of Churches and the Canadian Council for Refugees are all parties in the Federal Court constitutional challenge that argues the U.S. is not a safe country for refugees. U.S. President Donald Trump's immigration policies are raised in this case as part of the evidence for why the U.S. is not a safe country. A spokesperson for Immigration, Refugees and Citizenship Canada said in an email to CBC News this week that "Canada has carefully analyzed recent developments in the United States, including the executive orders related to immigration and refugee matters, and determined that the U.S. remains a safe country for asylum claimants to seek protection there." Immigration Minister Ahmed Hussen has said there is no need to "tinker with" the Safe Third Country Agreement. This pending Federal Court challenge was brought to his attention before ABC even attempted to cross the border. There may not be political will to challenge the U.S. over this right now, but the courts will have a say. "I believe now it will be determined on a legal basis and not on the political climate," said Balasundaram, who calls this a crucial first step — and only a first step — in what could take many months to a year to see through. Toronto immigration lawyer Lorne Waldman represented Amnesty International in a 2005 court challenge to the Safe Third Country Agreement, which won in Federal Court but lost on appeal. "It is not going to be easy to challenge," said Waldman. "I would bet the government would not want this case to go ahead." In the previous case the court did not consider it a charter challenge, and there was not an individual such as ABC with a strong argument to make. "I think the case will be heard," said Waldman. "Its likelihood of success will depend on the evidence."